I don't know why but this is always a busy meet. We ended up with 28 of us and taking over the entire hostel. The weather forecast was great and promised two days of light winds and snowy views. On the Saturday Fiona, Mike, Paul, Claire, Antti, Anastasiya and Aga went off to the western Grey Corries and managed to avoid doing too much trail breaking but plenty of up and down just making it back to the safety of the forest tracks before full darkness. Meanwhile on the eastern Grey Corries Nigel, Perry and Alison F were trail breaking up Stob Ban whislt Tony and Gonzalo were on Stob Choire Claurigh. 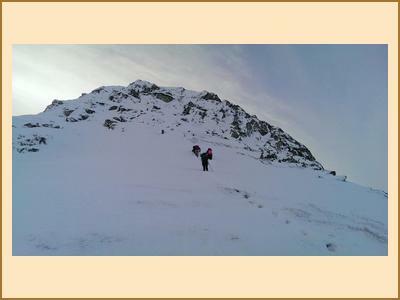 Further west, Anne & Alan R were on Aonach Beag whilst Alison and Fiona took the gear for a walk on the Ben. Ged, Carla, Rebecca, Ali, Hannah, Clare and Monty discovered that there was a lot of trail breaking required on Stob a'Choire Mheadhoin.No chance of adding Stob Choire Easain in those conditions. Longest day award went to Chris, Katrina and Martin who had a lot of trail breaking on Ben Tee and Sron a'Choire Ghairbh. Kenny & Alan H both made it to Glen Roy for some of the Corbetts. The main thing about Saturday though was the Sun. What a day, blue skies and light winds. A sociable night enjoying european flavoured vodkas rounded off a great day in the hills. Good use was made of the sauna. Sunday was a bit duller but still settled. The highlight being the only climbing of the weekend where Chris and Katrina did Ledge Route on The Ben. 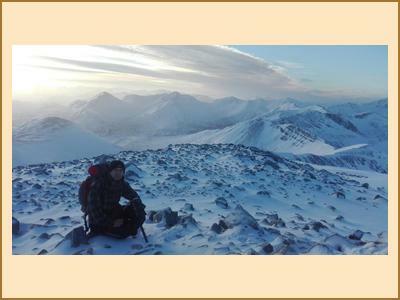 Fiona and Mike made good use of Saturdays trail breaking with a walk over various summits on the eastern Grey Corries. Alison , Kenny and Paul also made use of Saturdays trail breaking with a traverse of the Aonachs. Clair, Alan H, Antti, Carla, Aga and Anastasiya went on a waterfall walk at Inchreebefore heading up Beinn na Gucaig where they had fantastic views. Everyone else went on a mass assault of Beinn Teallach where Nigel managed to find enough snow for his snowshoes. Always a sociable meet at Aite Cruinnichidh with a great atmosphere helped by fantastic weather. Thanks to everyone who came.